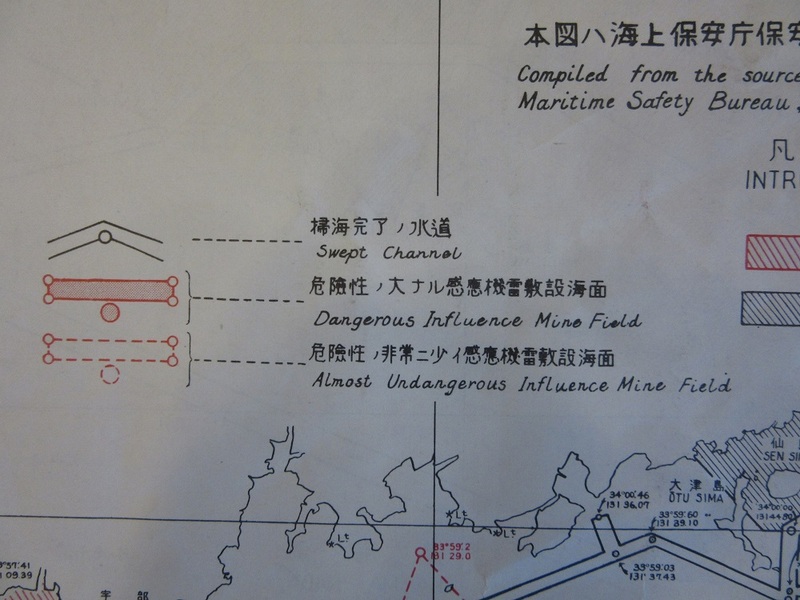 When it comes to maps showing paths through minefields you’d presumably, stuck behind the wheel of your boat, hope for something more than a legend that includes’ Almost undangerous influence mine field’. 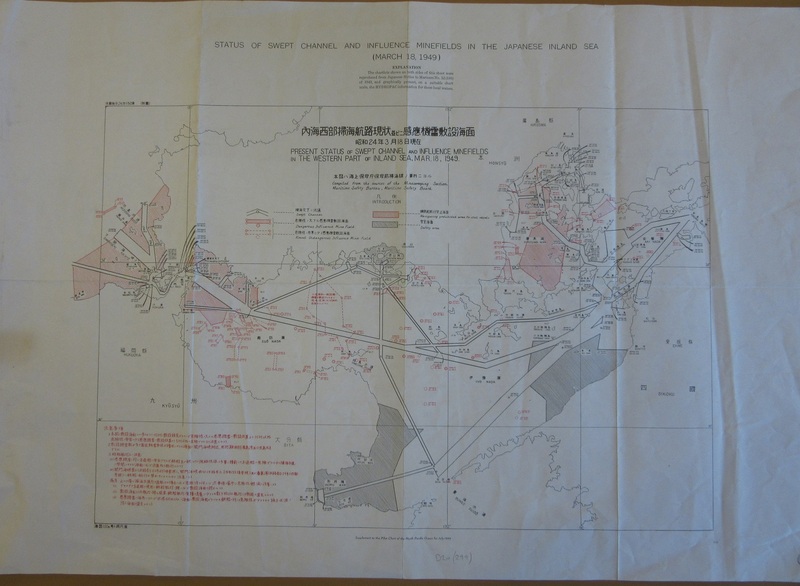 This map, the ‘Status of Swept Channel and Influence Minefields in the Japanese Inland Sea (March 18, 1949)’ shows how hazardous life was in the years after the Second World War. 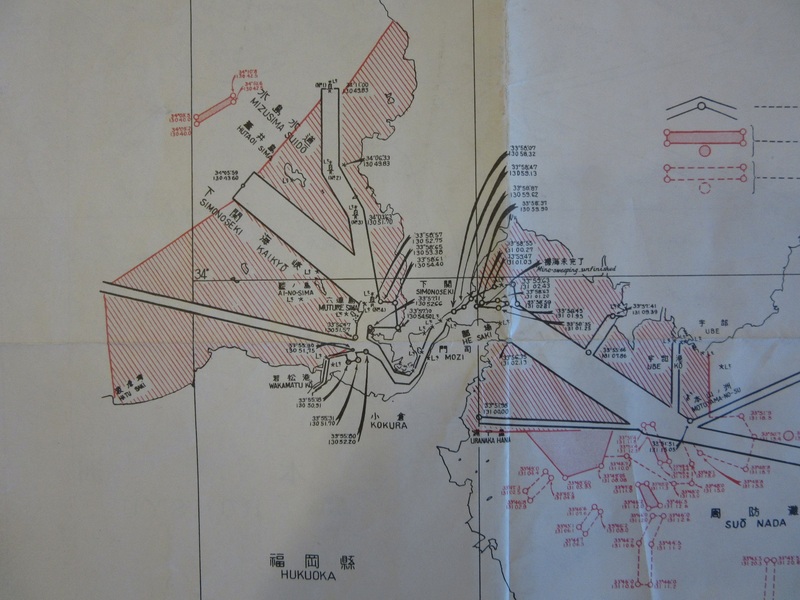 Four years since the end of the conflict (which culminated with the Atomic Bomb drop over Hiroshima, which is in the top right of the map) the inland sea between Kyushu and Honshu is still awash with mines with only a narrow safe channel separating the two islands. An influence mine defers from an ordinary mine in that it can be set off by the actions of a ship nearby, by changes in pressure, electronic signals or magnetic variation. The map shows the danger areas in red, with the clear channels those that have been swept clear of mines. Black-inked areas are safe. The map is a supplement from the Pilot Chart to the North Pacific Ocean series, a wonderful archive of maps published by the U.S. Hydrographic Office on a monthly basis over a number of years from 1912. 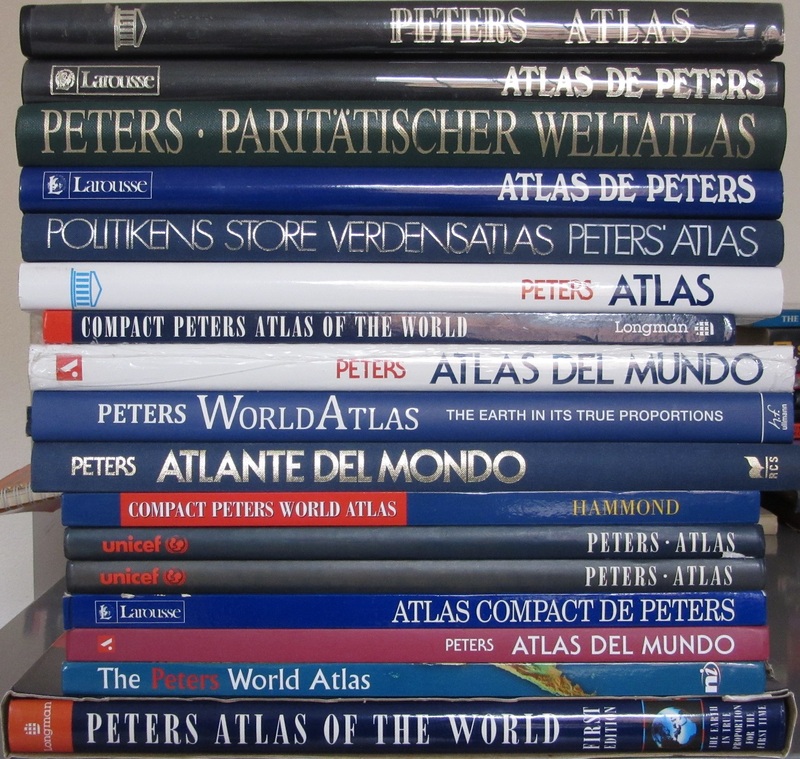 The maps show currents and weather patterns and often feature articles on the reverse on such diverse subjects as typhoons, whales and signals. This entry was posted in Military on 26 May 2017 by stuart. 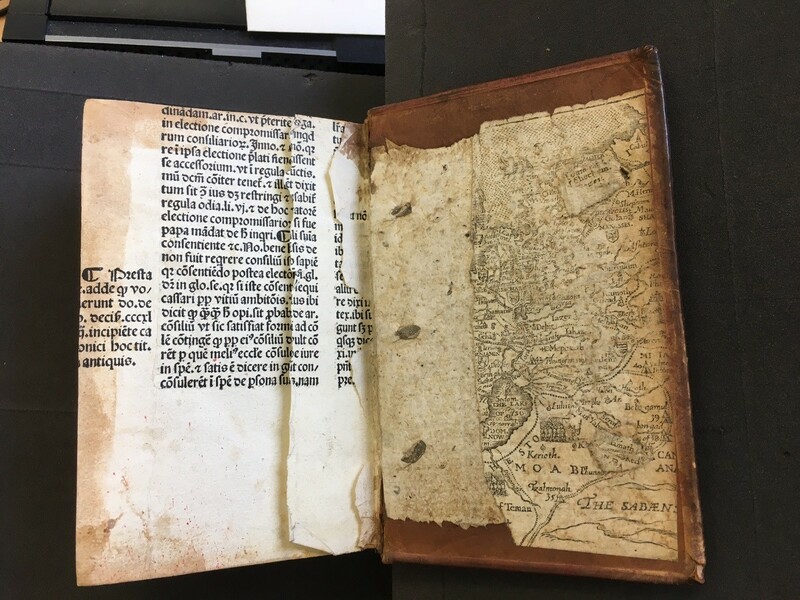 The Conservation staff were checking the Duke Humfrey shelves for items for repair when they came across an unusual example of printed waste fragments used as pastedowns. This practice, born of economy as no bookbinder would wish to waste a clean sheet of parchment or paper when a surplus or damaged sheet would do, started early in printed book history as there examples of William Caxton’s work used this way but was especially common in the first half of the seventeenth century. What is more unusual is that it is cartographic waste. 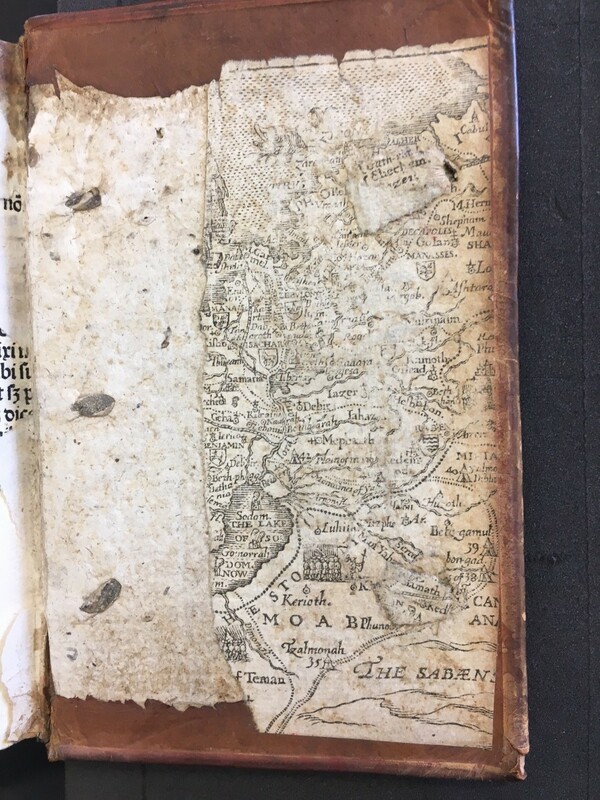 This example is of a John Speed work usually found in the King James Bible, Map of Canaan which he originally published in 1598. The endpapers are also blackletter printers’ waste. 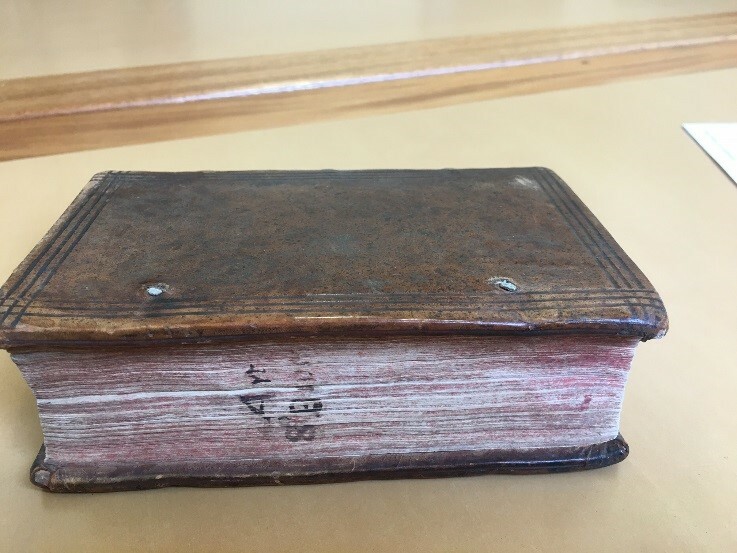 The volume contains two Latin texts: Philosophia theologiæ ancillans; hoc est, pia & sobria explicatio quæstionum philosophicarum in di sputationibus theologicis occurrentium by Robert Baron (1593?-1639) published in St Andrews in 1621 and De legatione evangelica ad Indos capessenda admonitio. by Justus Heurnius published in Leiden in 1618. Often interesting printer’s waste is not evident unless a volume is damaged. The binding is full sprinkled calf with fillets on upper and lower boards with evidence that it once boasted ties. 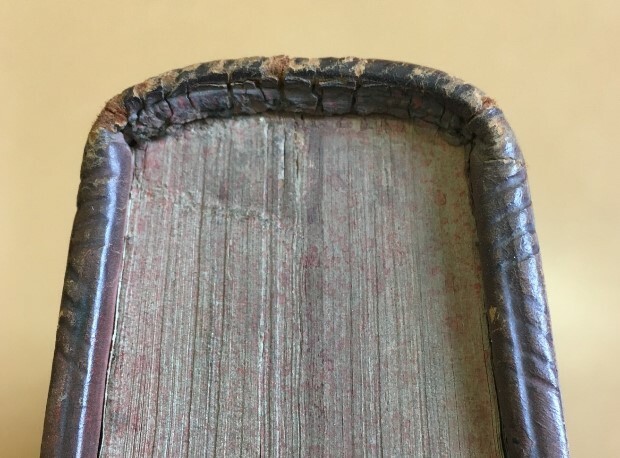 What makes it recognisable as an Oxford binding is the two way hatching on board edges. 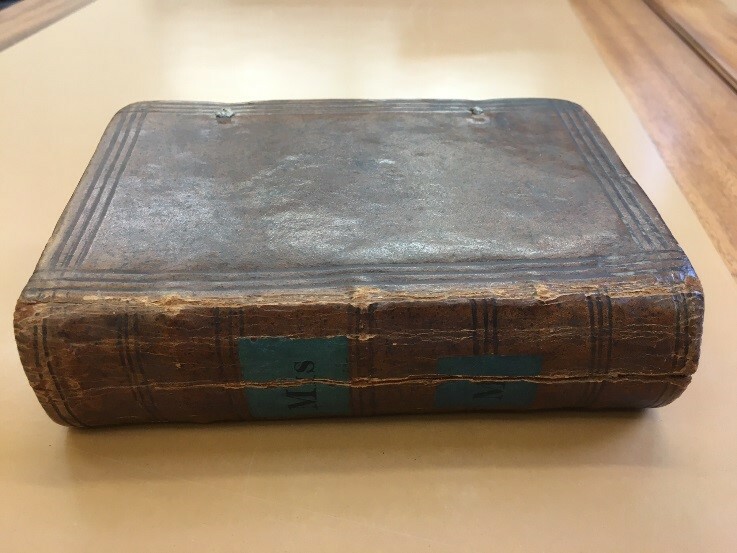 The shelfmark is 8° B 105 Art., written on the foredge, denotes that is comes from one part of the original Bodleian four-part classification which sorted texts by faculty or subject including mathematics, history, philosophy and literature. 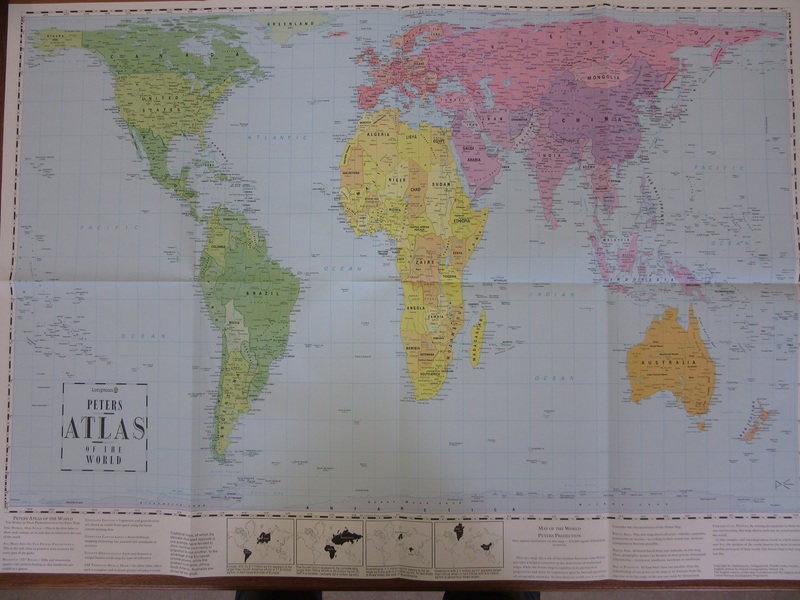 This entry was posted in Cartography, Humour, Librarianship on 17 May 2017 by tessa.